Guest post from my mother, Laura! 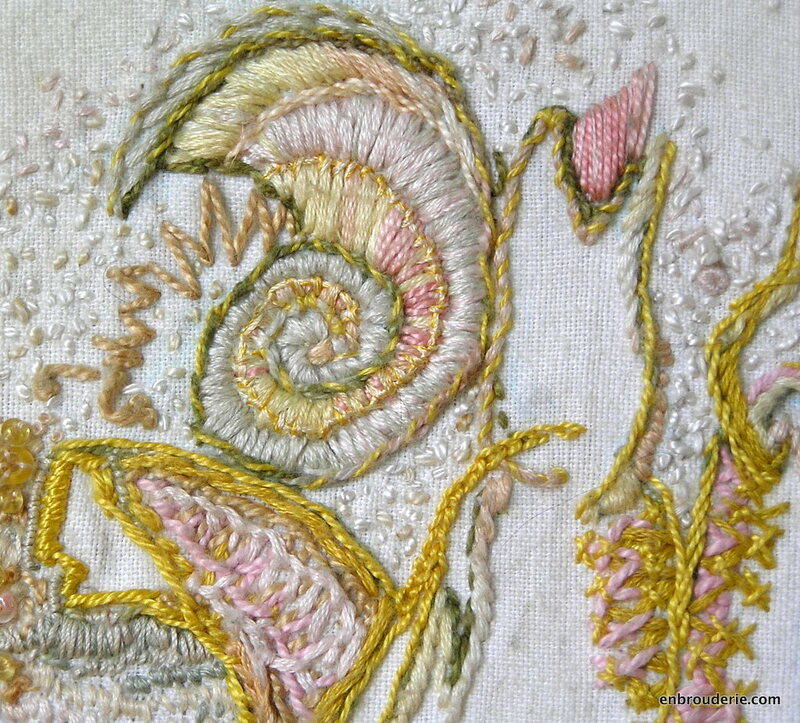 A while ago my daughter Hannah discovered PinTangle – Sharon B’s fantastic website for embroidery and crazy quilting. She shared it with me and in the course of clicking through all the links I found Sumptuous Surfaces. SS is her course on embroidery design and embellishing. We both signed up. During the course students chose a theme, planned two embroidery projects and carried them through to completion. I chose a beach theme with a hand holding a shell. I then spent several days and many pieces of paper drawing the hand, over and over and over. Trying this, then that, then the other. Eventually, I had a design and I was stitching away. This is the first hand I designed and stitched. 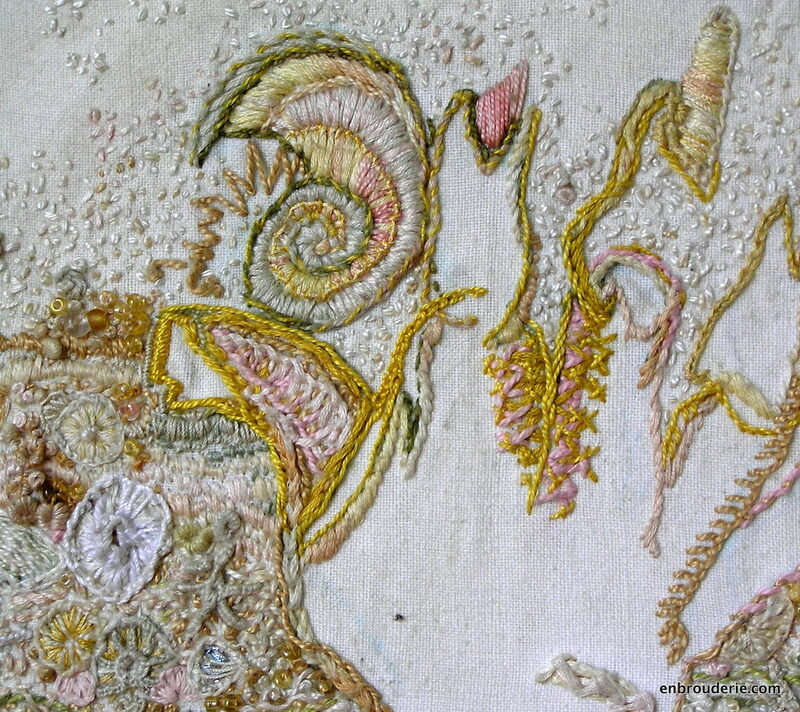 The zig zag straight stitches of the snail’s body are finished off with French knots for his eyes. His shell is made of stem stitch and satin stitch. 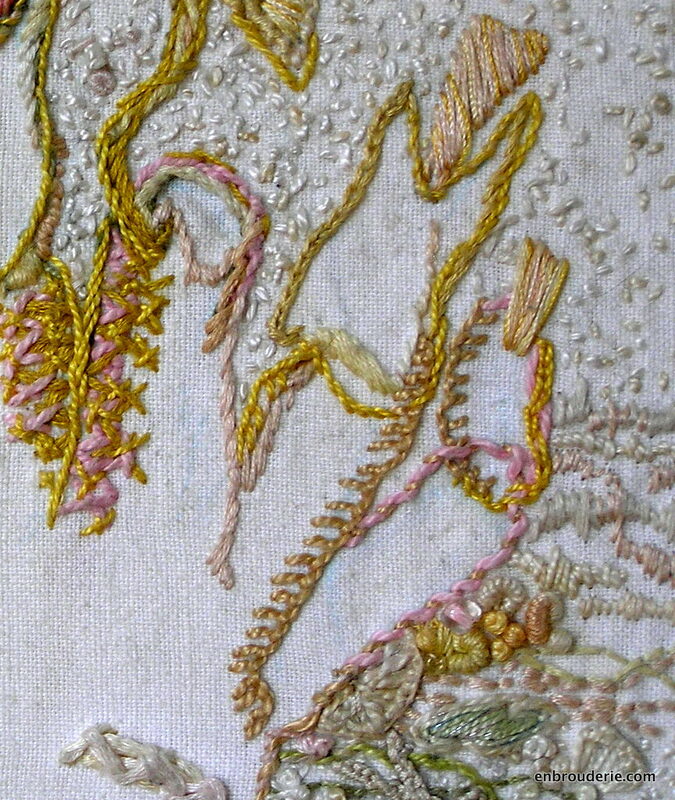 The hand is outlined in a variety of line stitches. The textured background defines the hand shape, the inside of the hand is left free of stitching. The fingernails are done in satin stitch. The beach surrounding the hand is made of all kinds of textured stitches. There are French knots, seed stitches, bouillons, and buttonhole wheels, as well as lines of back stitch and satin stitch. There are even a few beads for extra pretty. I tried out just about every line stitch I could on the hand outline. Recognizable stitches include button hole, whipped straight stitch, stem stitch, chain stitch and back stitch. That white line at the bottom is something of a mystery – poorly executed herringbone over something else maybe? Oh well, it was the first time I had done embroidery in a very, very long time. Everything considered, such as this is the first embroidery I had done in at least ten years or so, I am pretty happy with the results. I certainly had fun. This entry was posted in Mother, Surface embroidery and tagged art embroidery, embroidery, freestyle embroidery, textured embroidery. Bookmark the permalink. Sumptuous! Pin Tangle has the Take a Stitch Tuesday 2012 Challenge going on now. We’re on week three. Sharon Boggon has a lot to offer for the novice stitcher and the experienced, too. I agree. I love looking through the TAST posts. Hope you have as much fun with them as I do. It’s lovely. I’d have never guessed you hadn’t done embroidery in a long time. What a wonderful thing to share with your daughter. Sharon Boggon is the best! She is very generous with her stitching wisdom and that’s great for a novice. Thanks. 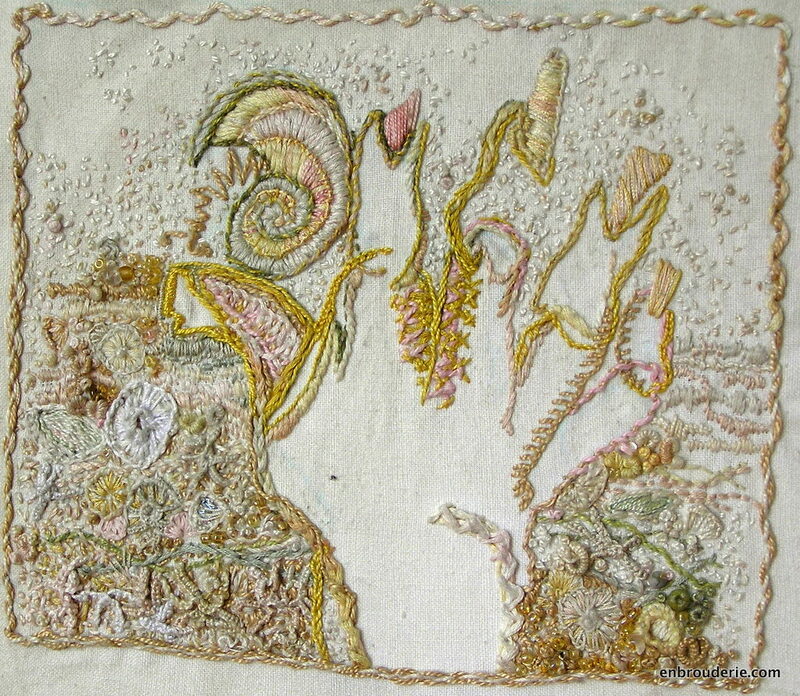 It is great that we share an interest in embroidery-makes it even more fun. I just love your choice of stitches and colours. I can’t really take credit for the color choice. Sharon B. very strongly recommended using a neutral monochromatic color scheme in the first project. While this eliminates a major design hurdle and simplifies the whole process my natural inclination is much more towards the gaudy side of things. I did enjoy working with the neutral colors more than I expected to but it was hard to restrain myself. It certainly looks like it was fun! Seriously Fun. So much so that I continued on and on and on and…….. So good to hear nice things. Thanks.